In this continuation of the "InCryptid" series by Seanan McGuire, we actually abandon the main character from the first two books (Verity) and focus on her brother, Alexander Price. This certainly takes the series in a new direction. 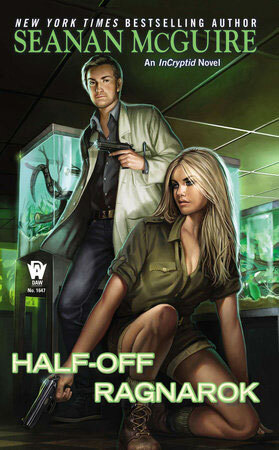 The premise is that Alexander is "hiding" in plain sight as a reptile specialist at a zoo. What he's really doing is investigating the feathered frog cryptids in the area, while hoping his basilisks decide to breed sometime this century. Meanwhile, he's dealing with a potential relationship with Shelby, a visiting scientist from Australia who plays with lions for fun. But then people start dying . . . by turning to stone. Suddenly, the local cryptid community is at risk of exposure and he needs to figure out how to keep the Covenant from converging on the zoo for a purge, while simultaneously figuring out exactly what's going on with his girlfriend Shelby. I like the fact that this book takes us from one main character to another in the Price family. Focusing on one character in particular for an extended series can sometimes become . . . monotonous. I think Seanan has done a good job of giving Alexander enough difference from Verity that it doesn't feel like "Verity in drag" here. For a while I thought that the relationship issue in this book would mimic the relationship issue in Verity's books too closely, but thankfully that didn't happen. This book also had a much more linear plot to follow than the Verity books; it wasn't a "random" in terms of what was happening and why. There was a clear thread to follow through the whole book, and it resolved nicely. That said, I don't feel like Alexander is as strong of a character as Verity. He isn't as interesting to me, and the situation he's put in in this book isn't as interesting as what Verity ran into either. So while it's a perfectly good story and a fun read, overall I didn't feel as strongly drawn to this book and these characters as I was Verity and the earlier books. I liked some of the plot elements better (what's happening with Sarah, for example) and I certainly liked the clearer plot thread, but the stakes didn't seem as high here. In any case, as I said, a good, fun story. Definitely worth checking out.